Figure. 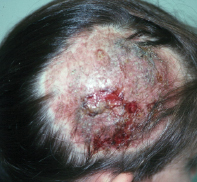 The rapidly expanding area of alopecia on the patient’s scalp. The raw area shows where there has been an attempt to insert a drain. A 12-year-old girl presents with a rapidly expanding area of alopecia on her scalp (Figure). It is painless, and she is systemically well and afebrile. Cervical lymphadenopathy is present. The correct diagnosis in this case is kerion, which is an acute, inflammatory form of tinea capitis. There are many forms of tinea, a superficial fungal infection caused by dermatophytes. These fungi require keratin as a substrate and therefore do not cause systemic infection. The dermatophytes can be acquired from other humans (anthropophilic species), animals (zoophilic species) and soil (geophilic species). Zoophilic species often cause highly inflammatory forms of tinea, whereas the anthropophilic species cause low grade but chronic and hard to treat infections. There is geographical variation in the distribution of the causative organisms. The number of species that cause infection in Australia is relatively small. In adults, the majority of tinea infections are caused by Trichophyton rubrum, which is an anthropophilic species. In children, the infection is often acquired from zoophilic fungi carried by pets, particularly rodents such as guinea pigs and mice. The organism that is most commonly isolated in children is Trichophyton mentagrophytes, which is a zoophilic species. Another zoophilic species, Microsporum canis, tends to infect dogs and cats and is a less common cause of tinea. Tinea capitis is principally a disease of children and is rare in adults. In Australia, a subspecies of T. mentagrophytes is usually implicated, but a different species, Trichophyton tonsurans, which is anthropophilic, is commonly responsible for scalp tinea in Indigenous children. For kerion seen in the patient described above, T. mentagrophytes is the organism that is most likely responsible, and questioning revealed that her family had recently acquired a guinea pig. A kerion often has an alarming appearance. The acute inflammatory reaction results in a rapid effluvium with gross erosion, erythema, oedema and scale involving the scalp. Swabs may show Staphylococcus aureus. However, the infection does not become systemic, so it is not surprising that patients remain quite well systemically and rarely complain of severe pain. A kerion is a spot diagnosis. However, it is not uncommon for doctors faced with this problem to suspect severe cellulitis or abscess and to attempt to drain the lesion (see Figure). It must be remembered that a patient with a bacterial infection of this severity would be unwell, febrile and in severe pain. The lack of systemic disturbance is the key to an accurate clinical diagnosis. The presence of cervical lymphadenopathy is nonspecific and occurs in most inflammatory scalp conditions. A diagnosis of tinea capitis may be confirmed by fungal culture of a scraping taken from the edge of the lesion or from plucked hairs. It is, however, not uncommon to encounter false negatives in the case of a kerion because the intense reaction may in fact destroy fungal elements. It is good practice to commence treatment for tinea capitis on clinical grounds. In the past, ultraviolet light examination was recommended to diagnose tinea capitis, but this test is much less useful than culture because the only species to demonstrate bright green fluorescence is M. canis, which is relatively uncommon. All forms of tinea capitis must be treated with oral antifungal medication. The most effective is terbinafine because it has fungicidal activity; however, griseofulvin, fluconazole and itraconazole, which have fungistatic activity, are also effective. The only medication that is listed on the PBS for this indication is griseofulvin. Treatment should be continued until a fungal culture of a repeat scraping is negative, the hair is regrowing and the scalp is no longer inflamed. This may take six to 12 weeks. Some clinicians also treat S. aureus if it is found on swab culture, and others recommend oral prednisone to settle the inflammation. There is no good evidence that either of these measures adds to management. However, use of ketoconazole shampoo by the patient as well as other members of the family has been shown to reduce the risk of passing the infection on to others.1 Permanent alopecia is unusual after a kerion, and complete recovery usually occurs. 1. Greer DL. Successful treatment of tinea capitis with 2% ketoconazole shampoo. Int J Dermatol 2000; 39: 302-304.